It’s true. 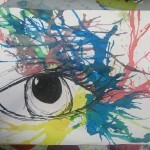 I’ve neglected this blog for so long. Not because I don’t want to write posts. I have so many ideas for posts. I’d love to find some spare time to write about amazing lessons, share great resources, reflect on trends in education etc … but I simply cannot find the time. Like most teachers in NSW, or Australia, or anywhere in the world today, each week we face burnout and have to accept that there are not enough hours in the day to get everything done, or give everything all we’ve got. And most teachers I know are overachievers who feel that they let themselves, their students, their colleagues or their families down when they drop a ball. We have so many balls in the air we cannot juggle them all. I constantly tell this to my less experienced staff who are in their first 5 years of teaching, or the first year on a class for 12 months. I say “Just accept that every term one area of your teaching will be awesome, and another area will be crap”. I accepted this long ago, and it has been even more apparent as I share my class teaching duties with my role as an Assistant Principal (AP). Never have I had a perfect term with 6 perfectly taught KLAs. So I wanted to write a post like this for a while, or even a series of posts, focusing on “A day in the life of …” Half way through the day featured in this post, I thought, yes, this is the kind of day I am talking about. 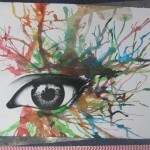 The day that drains you and pulls you in all directions. I did a poor effort in explaining the stresses and events of the day to my partner, and without running him through all the minutiae, he couldn’t quite grasp why I had come home sensitive, snappy and exhausted. So to enlighten him, and many other people in the world, here is a rundown of my day. 7.20am I arrive at school after my long commute. I have to leave early to beat the traffic, but it means I can get some time to myself in the morning to get things done before others arrive. As I tell newer Assistant Principals – “Your time is not your own”, so cherish those quiet moments you can just focus on getting what you want done, without half the school seeking you out for some reason. Once I arrive I make a cup of tea and eat breakfast, unpack my bag and my laptop. I open my emails, checking anything urgent. I am suddenly inspired to open the pack of Year 6 graduation photos that have been on my desk for a week, complimentary from the school photographer company. This was a bad decision as I realised that the photo they had chosen of ‘All of Year 6’ wasn’t ‘all of Year 6’, as 2 students were missing, who were present at school on the day. Flashbacks to photo day (madness in March it was) and I recall 3 classes being out on an excursion, some meltdowns, photos being taken through lunch and a whole lot of juggling of timetables. I am super annoyed this has happened, as we cannot send a photo home of ‘Year 6’ to two families whose children are not in the photo, and to make it worse, were not even mentioned by name. By now my School Administration Manager (SAM) has arrived so I go and chat to her about the issue, and possible solutions. Since these were complimentary photo certificates, can we ask them to come back and retake the photo and reprint all the certificates? Can we just reprint with head shots only? Will we have to pay for it? I then tell my Principal who has just arrived and we decide the SAM will call the company to see what our options are. Luckily, I opened the photos now and not just left them in my office till December when we need them! (Not that I have ever done that….EEK…YES). 8.00am We then assess ‘The Board’ – a.k.a the whiteboard in the office corridor that explains the comings and goings of staff, who is out, who is in, who is replaced, timetable changes, duties covered. For the umpteenth time we joke that we need a bigger board. We have six teachers absent today as well as two teacher’s aides. Miraculously, we have casual teachers for all, so no splitting classes today. (But we did split one Monday, then Wednesday, then Thursday). We assign all casuals playground duties, change RFF times and reallocate any other blocks of time that we can use. The SAM then prepares the casual folders, lists and keys for new timers and I go searching or ringing for staff who need to know about necessary changes. I walk through the playground, tell off a bunch of kids for not sitting down before the start of duty, check in with 4 people, see the General Assistant (GA) and tell him I will catch up with him soon about the installation of 3 new Interactive Whiteboards (Assistant Principal Technology Coordinator Extraordinaire), direct a new casual to the office, say hello to a number of parents and students and then end up back at the office. We have families coming today to see a number of projects, so the other Assistant Principal and Principal are busy with that. One Assistant Principal is at a conference, one is at home with a sick family member, and one is in Europe on leave. We have two relieving APs, both doing a great job. 8.30am I continue to troubleshoot the morning and make sure we have covered everything. Faces come and go and ask or inform me about anything and everything. What about 4F’s computer time? What time is the case meeting? Who’s doing detention duty today? Do we have someone to cover gate duty? What is the staff meeting about today? Can you fix my computer? There’s a parent on the phone for you. There’s a child wanting to see you. Here’s that form you need to fill out. Sorry I ate your lunch yesterday. 8.55am Morning assembly and line up. I greet my class and check in with student A – high needs, whose Occupational Therapist is there to observe him. I check in with students B and C, anxious students who may need support due to a number of family issues. I rush up to the microphone (Tuesday – my day, oops! 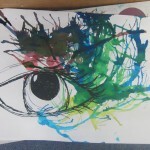 ), greet the school and do any messages. Gardening club, dance group, who’s not here, bring notes for this etc. 9.05am My teaching day starts! I continue to talk to student A as we walk to our room. Have you had breakfast? No? Have an Up and Go. Did you sleep? Where is your engine? (Our mood checking language, low engine = tired, depressed, inactive; high engine – overly active, impulsive loud). My room is far away so we stumble through the playground and get going for the day! 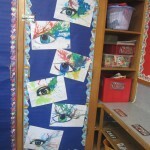 I play the entry song, bags away, grab whiteboards, come to the floor ready for morning routine. Do a roll check, hmmm student D still not back, will have to phone and check. I see someone is teary, ask my teacher’s aide to check in with that student. I am only on class for the first hour on Tuesdays as I am released the rest of the day for AP duties. My class have computers, library and another teacher for the afternoon. 9.30am. After morning routine (with student A very low and needing support and redirection to perk up and stay awake, student B being upset and rolling under desks, ignoring all encouragement and redirections) student E walks in, completely out of uniform, late (late nearly every day), surly. The staff member who brings her in then fills me in on the events of the morning – causing the surliness. I do my best to engage and encourage student E to join in, but student E refuses, sits at desk and draws and writes in her journal. First chance I get I go over for a conference, check in, tell her we’ll catch up later. 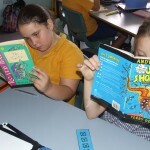 The next 30 minutes are our spelling and vocab lesson, much the same – supporting student F and student G who are writing at an early kindergarten level (in year 3), throwing out extension ideas for my ten students working beyond year 3 and 4, encouraging student B to come out from under desks. A quick check in helps, as most of my students with high needs just need time, care and support from me. 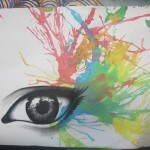 Beneficial, but time consuming. Student A has perked up, good. I also have 3 phone calls on the classroom phone in this first hour from the office, another teacher, the boss. Again, an AP’s time is never your own. 10am I’m off class now as I organise my students for computers. I keep student E back for a lengthy chat about the morning, including her altercation with the principal. Usually stubborn, she responds to our chat as we walk to the ICT room and agrees to meet me at detention later that day, which is a small win. I drop my students off, speak to an aide who lets me know that a class with a casual teacher is mucking up, and tells me some students who might need to be removed, students I am managing constantly. I am meant to meet with a staff member about an excursion on Friday that affects half the school to organise lists, rosters, split classes, teacher roles etc. I forget that ICT regional staff are here to meet me for a site inspection of cables, switches and wireless. 10.15am Put my “ICT coordinator” hat on and walk around the school for 45 minutes with the two ICT visitors. This involves entering a number of classrooms and storerooms. 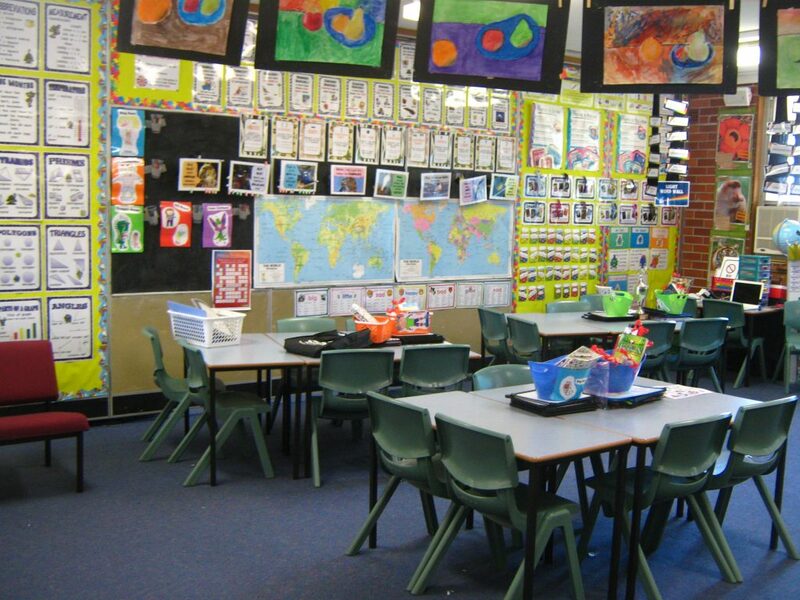 In my travels I come across several casual teachers, which is good as it gives me an overview of what is happening in classrooms, and who may need support – teachers and students! I speak to a few people and make a mental list to report back to the principal and rest of the executive team on any issues bubbling. 11.00am Back in the office, I farewell ICT staff, take a phone call from a staff member about a family of 3 with no food. Touch base with boss about casuals, ICT report, and her morning of dealing with a difficult school avoider and their family, and showing new families around. I take the 3 siblings to the canteen to get some food, then grab their contact details to follow up the lack of lunch, since this is the second time. Check in with student E at detention, speak to 5 other students at detention who I supervise in my role as AP, reminding them of school expectations, consequences etc. 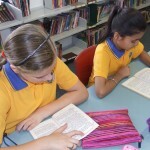 11.15am Grab some quick lunch, touch base with a few people, read and send a quick email, fill out some forms and lists. 11.40am Lunch ends and I realise that in my organisation of the day – we had a case meeting and needed 4 staff to attend, I had overlooked 45 mins of RFF and a class was left hanging. MY CLASS. I frantically find my RFF teacher, throw her back on class, even though she was meant to be having her own time, promising to make it up on Thursday. See, dropping a ball. Immediately after I’m called for assistance for 4 students in another class mucking up for a casual, and following a lunch altercation they were now getting physical. Since all other executive are either away or in the case meeting (that went for 2 hours) it’s just me left to do issue management. I remove the four boys, ensure they are calm, collect a fifth from the office who has been sent to calm down. Remediation begins, and I lose the next 45 minutes finding out who did what to whom for the last 90 minutes that lead to this blow up. A lot of he said, she said, dobbing each other in, changing stories and throwbacks to past issues. I diligently speak to all students, record it all and then lose my patience and decide enough! All boys agreed they had done something wrong and thus I dished out the consequences. 12.30pm By this point I figure there is no point sending 4 of these boys back to the casual teacher as it would only get worse and I would be called back to assist. So I keep them with me. They assist me to write a note home for their class cancelling their assembly item tomorrow as their teacher is away sick most of the week and they have not had time to rehearse. “Oh Miss? Do you write the notes? I always wondered who did that?” We get the note typed, printed, checked, copied and delivered. 12.50pm The boys and I head to the hall to rehearse with my choir. They aren’t impressed but I am not putting them back in class to just muck up again, and then be called out, I NEED to rehearse my choir as we are performing tomorrow at assembly. I rehearse the choir, pray that it will be alright on the day. Check in with my senior choir members who are heading off on a rehearsal excursion the following week. Have you brought your note? Can your mum drive students? Have you practised your parts? 1.20pm Dismiss the choir, return the boys to class on strict ‘you need to behave or else’ instructions and grab some recess (We have lunch first at our school). Finally speak to my colleague for ten minutes and sort out the excursion lists and details. Check in with my boss who has finished her case meeting and we discuss the welfare needs of the family with no lunch. 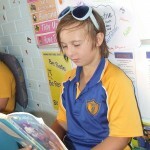 I speak to one of the students and get some more info about what happens at home in the morning. Who makes lunch? What do you normally have? What happened today? Where was mum? Where was dad? How do you get to school? A few of these answers seem a bit dubious so I decide to ring home. After some unsuccessful calls we get in touch with dad, and I explain that the students had no food, recess or lunch and what had happened. I feel a bit off about this conversation so make a note of the day’s events in my diary, as I feel there could be hidden welfare issues. My boss and I decide to keep an eye on the family. It seems Student H’s tantrum consisted of yelling at the birthday girl and throwing items, including the cupcake Tupperware container at her and sobbing uncontrollably. Seems she got ‘rainbow flavoured icing’ and she wanted ‘unicorn flavoured icing’ (whaaa? They’re both blue icing? My head hurts). I remove crying cupcake thrower and take her to the office to calm down and discuss why you can’t get upset over free cupcakes. These occurrences are a regular habit, so the behaviour monitoring level continues. I make a note to call/speak to her parents again when I get a chance (Maybe in 2020). 2.30pm After 30 minutes Student H is calmer, we have discussed the situation and she has returned to class to apologise to all involved. My boss how has 2 other students she is dealing with, a whole new issue. 2.45pm Bell rings! I do my weekly scan of the top playground and gates to ensure the visiting high school siblings are behaving appropriately, this is also a regular occurrence needing monitoring. I say goodbye to a number of my students, answering their pleas ‘Will you be having us tomorrow? !’ with a resounding yes. I am then paged for a phone call from Student E’s parent, we both fill each other in on the events of the day and day before. There’s an abruptness at first about yesterday’s behaviour and consequence but I use my negotiation (read PR) skills and by the end of the phone call all is well and peace is restored. 3.00pm Meetings time! I grab my pre prepared agendas (lucky I did them last night) and rush over to the library to meet my team – my two teams combined of 9 people and we spend about an hour talking about everything from reports, to excursions, behaviour issues, attendance issues, timetabling issues – When is the debate? Who’s going to that? Have you done your awards? Are your Education plans on the server? What we are wanting to do on planning day? Did you get my email? How is everyone going with…. 4.00pm The day is nearly done! Meeting finished, I grab a drink and a snack and make my way to my office to regroup, tidy up, check emails again, check in with the other executive team, print some lists for Friday, organise split work and a split list for Wednesday. 4.45pm Leaving time! Spend my hour and a bit commute chilling out to the radio or making phone calls to friends. 6.00pm Home! Begin the night time of dinner, time with my partner, load of washing, social media check in, tidy kitchen, shower, cat cuddles etc. 8.00pm Hang on Significant Other, yes I’ll come hang with you.. I JUST HAVE SOME SCHOOL WORK TO DO… (every teacher spouse’s least favourite line). My at home school work 2 hour session consists of entering the behaviour issues of the day and prepping detention letters to go home for tomorrow, reading another classes reports (part of the AP role), organising some things for a lesson on Wednesday, and marking an assessment task to help me finalise my own reports. 10.00pm ME TIME! PARTNER TIME! REST TIME! Results in partner cranky I am working and me justifying why I am working at home – there’s no time! It’s a busy time of term! I had a busy day! It’s part of the job! 11.30pm BEDTIME… I look forward to a broken sleep, a brain that won’t switch off and a 5.30am alarm. NIGHT NIGHT! 12.30am … realise the assembly note went home with the wrong date. Woops. Just another day in the life of a busy AP! I love my study boxes! Well that’s what I call them, I’ve also seen them be referred to as carrels, partitions, dividers. 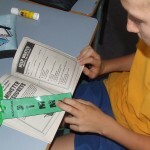 I bought mine about 5 years ago from Kangaroo Educational Supplies. 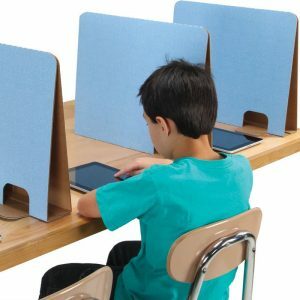 They are perfect for giving students a private distraction free space for learning. 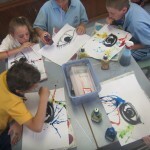 I can’t find any on the Kangaroo site but here is a link to some at classroomproducts.com. I also found them on Amazon – as privacy partitions. This site also has multi fold up ones for round desks! 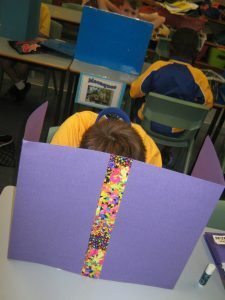 Students who have sensory issues or are on the Autism Spectrum can benefit from having a study box around them if they are feeling overwhelmed. 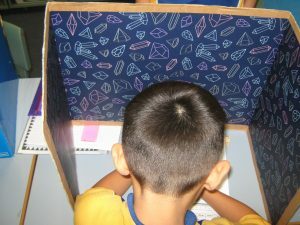 I have a student who likes to go under the table when he is overstimulated or anxious. 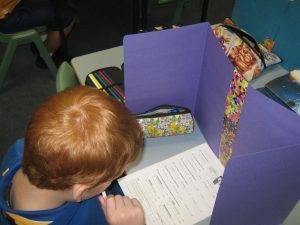 This term I have managed to transition him into a studybox instead, which gives him that ‘small safe space’ that he craves. Its great when you need to quieten a noisy group! My rule is, if you have a study box, you aren’t talking to others! 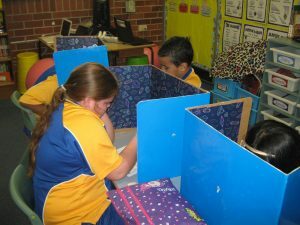 Sometimes the chatterboxes get a study box just so they and their buddies can have some peace and quiet in which to work! 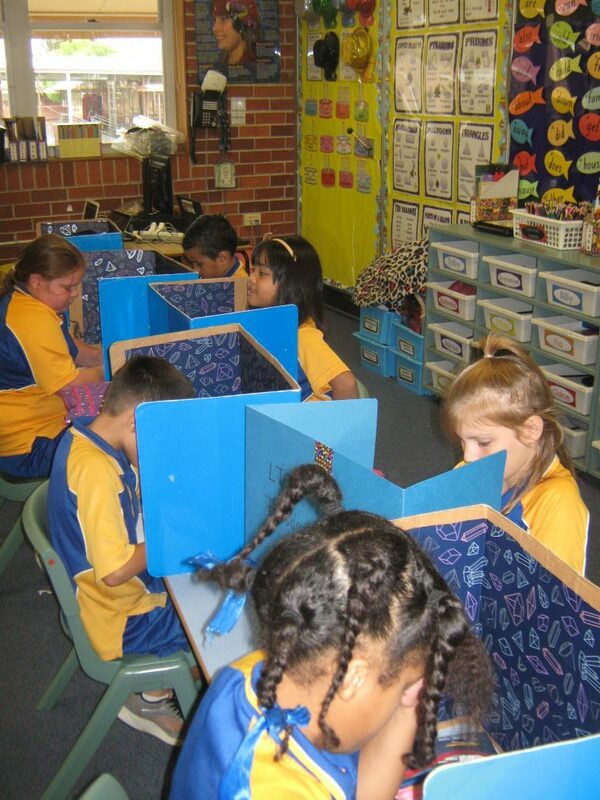 Oh and the teacher can get some peace and quiet too! They have lasted quite well over the years. A few of my previous students had scribbled some questionable language on the inside covers, so this year for year 3 I covered the inside with contact, to give them a new life in 2017. This year everyone wants one. I made some extras by taping two manila folders together. These aren’t as sturdy as the bought ones, but they are a simple temporary solution. This term I have literally been saved by sensory toys. 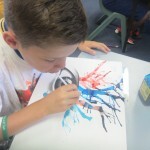 I have called them a variety of things – sensory toys, sensory items, calming tools, fidget tools, de-stress tools, fidgeters… but I have not used them as much in the past as I have this term with my Year 3 class. I knew this year I had a few students on the Autism Spectrum, some students with trauma backgrounds and some with sensory needs. I had my trusty box all ready to go. My neediest and most demanding student almost needs a constantly revolving rotation of items to help him focus, or stop fidgeting, or calm down, or wake up or keep on task. 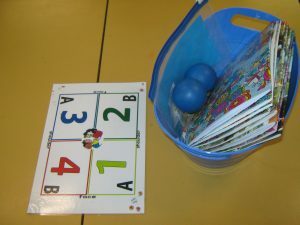 I had the “sensory toys” box out and in use by 10.30am on the first day of term. Since then the box and its contents have been constantly out and about in 3J. I have added some more items and split the contents into two smaller boxes; items for fidgeting and items for stress relief. I spend a bit of time teaching and modelling the use of these items to my students. 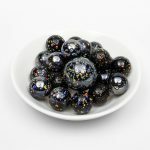 Other teachers, especially new and younger teachers have seen me using my sensory toys in the classroom and have quickly introduced them into their own teaching repertoire. I always caution them on ‘teaching’ the use of the items, otherwise they just become a distraction to the student, other students and you! 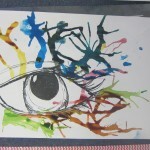 More on how I use the sensory toys below. So what’s in my kits? 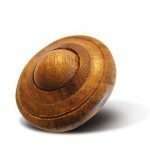 KIT ONE is classic fidget toys, things that keep the fingers busy. 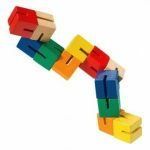 Rubricks cubes, manipulative fold up cubes and key rings, slinkies, wooden hand massages and puzzles etc. Most of these have been purchased from Sue Larkey’s website or have been gifts. 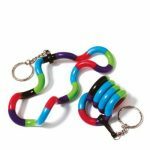 These kits are great for fidgeters, keeping students busy during tedious situations and even early finishers who like a challenge. 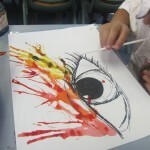 They are not so great at having in your student’s hands while teaching or learning, as most of them usually require two hands and to be looking at them. KIT TWO is more sensory – stress relieving items for calming and comforting. Shells, marbles, pebbles, stress balls, squish balls, off cuts of possum fur (more on that later) and other random textural items. I tend to give the items from Kit Two out more often, especially when my class get restless and unfocused. I keep an eye out at junk stores and dollar shops for small stretchy items and toys that can go in here. Anything that is nice to touch and hold can work. Which leads me to the possum fur item. A lot of people (mainly adults) balk at the sight of a full possum pelt sitting on my chair. 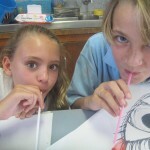 But my class LOVE IT. 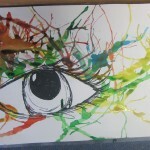 It is the number one hot property item for my students and it has so many uses. I also have some smaller, hand size pieces of possum fur in the sensory toys box. In New Zealand possums are an introduced species and are a threat to native flora and fauna. As a result possums are allowed to be hunted and culled. My cousin hunts possums and recycles their fur into a number of items. You can check out her unique store here. She gifted me my own pelt last year. 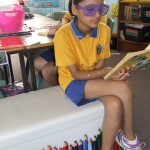 After sitting in my lounge room for a few months I took it to school. BINGO! 3J love it. 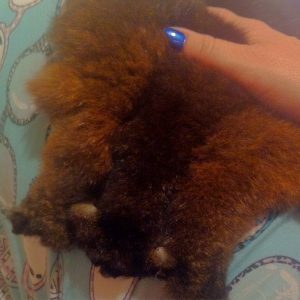 It is incredibly soft and rubbing your hands down the fur is very calming, akin to petting a cat or dog. I have two students in particular who are prone to becoming very overstimulated, stressed and they can have big meltdowns. Both of them will curl up in the corner and stroke the possum fur. Morbid? Possibly. Successful in reducing stress? Absolutely. Having the possum fur on your lap while you work, read or listen is the highest honour in my classroom. It can be used a reward, a distraction, a comforting tool or a sensory toy. 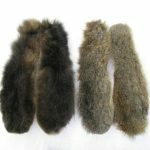 It has been so successful I am on the look out for more possum fur and other faux fur items, a sheepskin or bearskin rug perhaps? This is crucial and worth your time at the beginning. I have strict rules for using a sensory toy and if someone is unable to use them correctly, they lose the privilege. Most of these rules apply when using the toys with the whole class, while on the floor or working on desks. Rules are different if someone is using them in a calm down / time out space individually. When I give out a sensory toy the student MUST have it in one hand only. Most of them are nice to roll around, rub or squeeze so one hand is enough. This avoids the two hand hold that leads to the head drooping into the lap. They must continue to work / listen while holding the sensory toy. 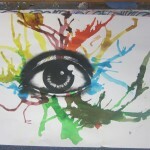 If listening, their eyes must be focused on me / the board. Once they start staring at their toy and zoning out, they lose it. It is also important the way you distribute these toys to students. I make it a point not to give them only to my fidgety/naughty/autistic students. Anyone can have one. That way the class don’t just see it as something different that only ‘Johnny’ gets. By handing out maybe 5-8 at a time I can insure that ‘Johnny’ gets one (because he needs it), but it isn’t obvious. It can be a reward for best listeners, a way to refocus off task or daydreaming students, a goal to work towards, a connection back to the lesson. I have a few students who always get upset when they miss out (one who throws epic tantrums) so I usually give the sensory toys out, then ask the students who received them to look for another student who is focused who they can hand their sensory toy to after a 5 minute period. 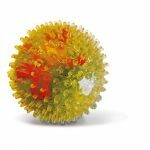 After 20 minutes or so every child has experienced a sensory toy and your lesson has occurred with hopefully everyone on task and fidget free. 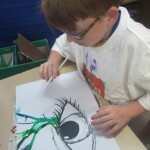 There are so many ways to use sensory toys and each teacher is different. In the past I have kept some in the time out box, some in my special ‘chill out’ box or in the tubs on the desks. When I had an all boys class a few years ago I had a box of slinkies and stressballs on each table. 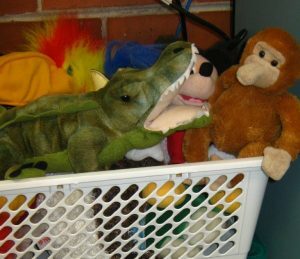 Along with the sensory toys, I also use a basket of stuffed animals, including our class mascot, Bosco. These are also a great success! The start of a new year is an exciting time for teachers! 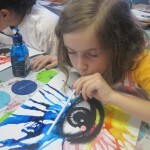 So many things you want to do with your new class, and get things ‘just right’. 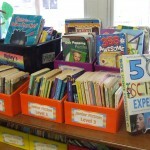 This is the year I will get the kids to diligently maintain a reading journal…. We tell ourselves this all through the summer holidays and as the term begins. 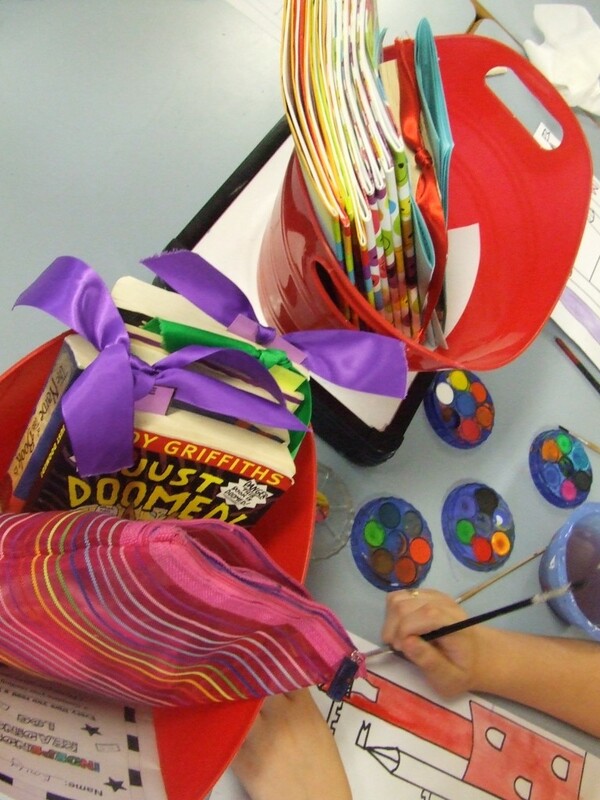 We are so optimistic and so diligent in teaching our new pupils ‘the way’ of doing things, everything from setting up their maths book pages to where to store their books and equipment. But usually by the third or fourth week in, THE STRUGGLE begins. Oh no! I’ve already forgotten to remind them to do that thing that I promised I’d be so diligent about…. and now things look bad! Darn it! This system isn’t working? Why did I ever thing this would work? How is it week 4 and I haven’t done a (insert important component) lesson yet! Why is everything taking so long to do? Why haven’t they ‘got this’ yet? I know that I am not alone in thinking these thoughts and living this struggle every day. Heck I know this struggle can last all term, all year! This year I am working with two temporary teachers experiencing their own class for the whole year for the first or second time. They have already come to me worried about ‘The Struggle’. How do I do it all?! I haven’t had time for…?! My kids just aren’t …!? WELCOME! I told them. You are now a real teacher. I reassured them that this was normal, and even for people who have taught for 5, 15 or 35 years, we all face the struggle, it’s a regular part of the job these days. Especially these days! You will never have EVERYTHING done. Relax and accept that. There will always be something you really want to do but it has to wait for a blue moon rainy night when there is nothing on Netflix (so, like never). 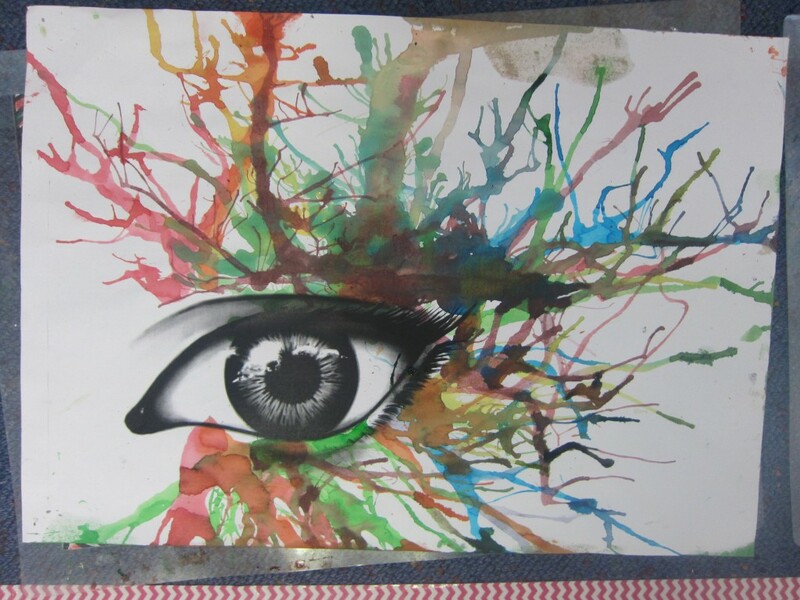 One KLA /Subject component every term will feel like you are doing a great job, you are smashing the teaching of it! And another area will be really crap and you never feel like you deliver it well. 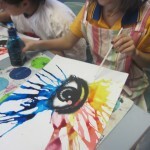 It is almost impossible to have every area fully planned, prepared, on track and bringing amazing results every lesson. Accept this and do the best you can. Don’t worry about getting it all done. Do less, better. Take time out to look after yourself or you will end up burnt out, and no good for anyone! Ask others for advice, even for things that seem mundane. Always be on the lookout for an idea that can make your everyday life easier. 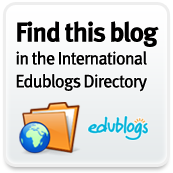 Surf the net, read blogs, listen to podcasts, hunt pinterest and sneak peek into other teachers’ rooms for ideas. Get specific advice from the experts – like the famous 40 hour teacher work week club. And sometimes, you just have to roll with a situation, throw an idea/lesson out the window, regroup and restart! Many teachers are familiar with the O.R.E.O planning model to assist students to write persuasive texts, where O.R.E.O stands for Opinion, Reason, Example, Opinion. 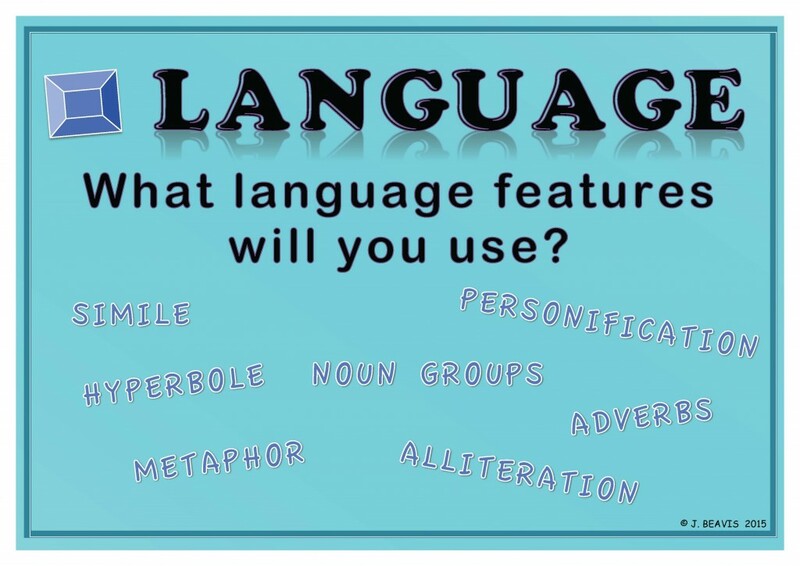 I wanted to come up with something just as simple for the planning of writing a Narrative, utilising an orientation, complication and resolution, with students focusing on the language choices they make as well. And thus O. P. A. L. S was born. Each letter follows the sequence of a narrative except for the L.
I added the Language section to get students to think about the types of devices they would include. 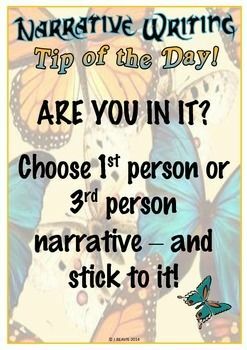 Vocabulary, adjectives, similes, etc, the Language section is a place to record them as they come into your head when planning a narrative. 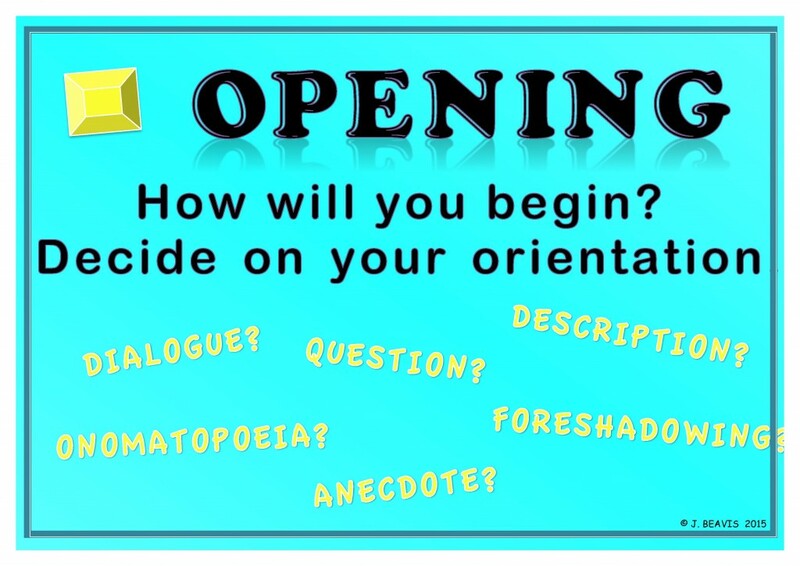 The reason I didn’t call the O ‘Orientation’ was to get the students to think about their very first line, how will you OPEN your story. 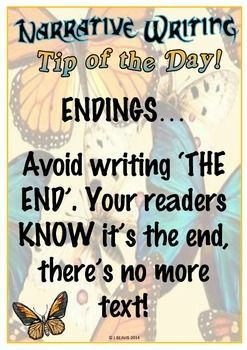 This follows on lessons we have done on ‘hooking’ your reader in from the very beginning. You will see that the ‘Opening’ poster mentions orientation as well. I made some posters for each section. To purchase the entire set of posters as a PDf visit my teachers pay teachers store. This was accompanied by some planning sheets with sections for each part of the O.P.A.L.S process. 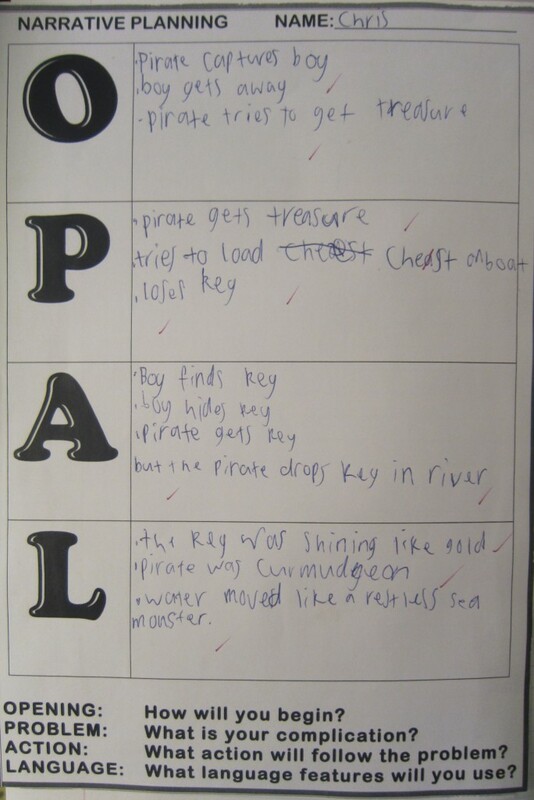 I modelled this approach with my class by simply writing O – P – A – L – S underneath each other down a blank page, and wrote bullet points next to each part. We had been reading and writing about ‘Adventures on the High Seas’ and I showed my year 5 and 6 class two fantasy images, one of a mermaid and one of a pirate ship. 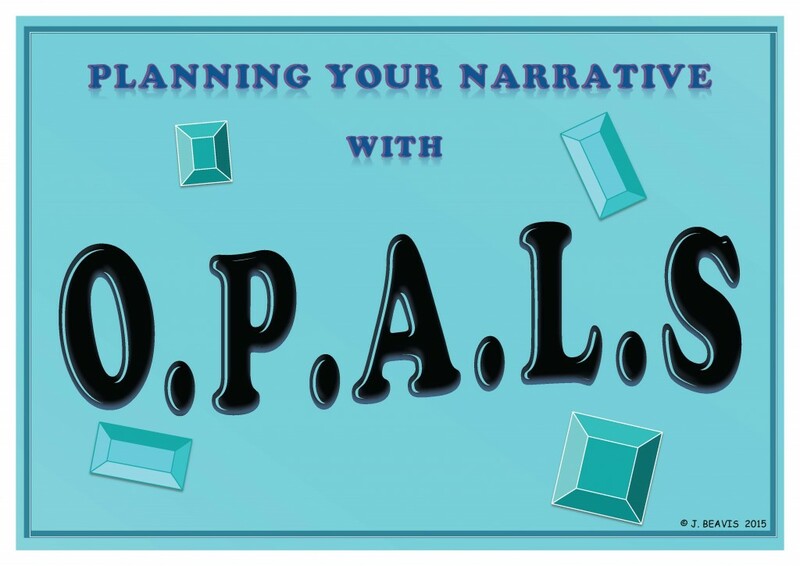 They had to use both or one of the images to plan and write a narrative using O.P.A.L.S (at this stage though, we only used O.P.A.L). Click here to download a free copy of the planning document used below. The following week we used our planning to write a narrative. 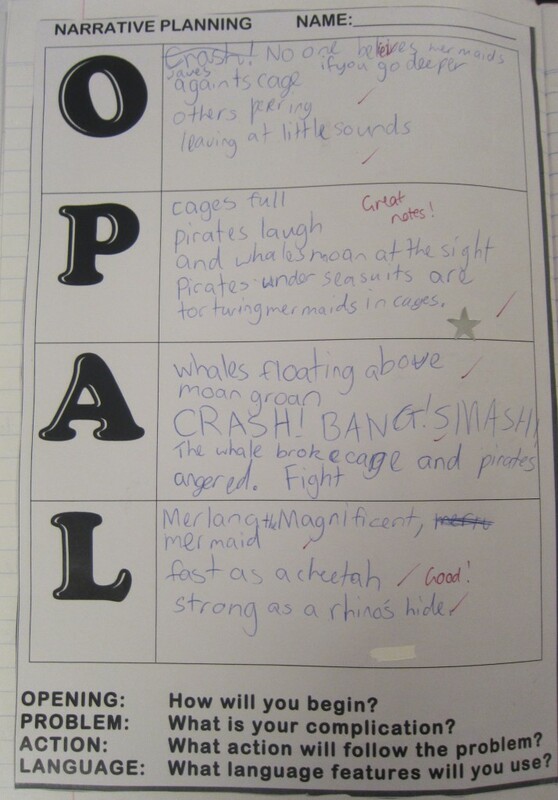 The results were really good, with many using the O.P.A.L sheet effectively. 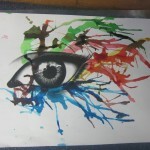 Here is a slideshow of some of the best narratives. Time for an upgrade for my reading corner/class library. I need some new cushions, chairs, beanbags etc, maybe to fit in with my jungle theme. 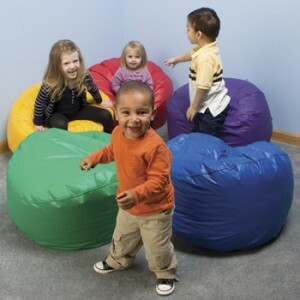 These beanbags look great, but out of my budget at $133 each! 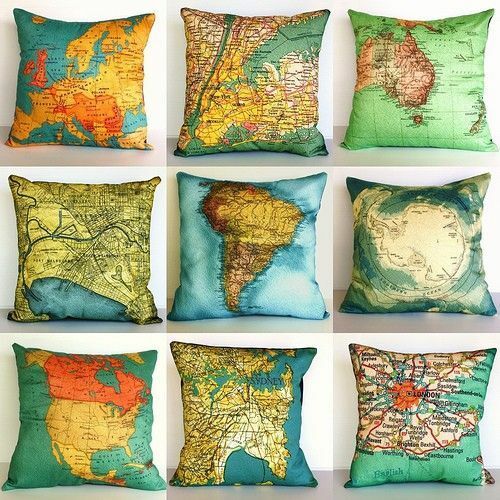 The map cushions look great as a set, found this on pinterest and the link no longer exists so no idea where to get them from or how much. 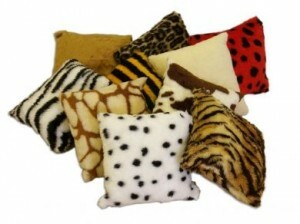 Love these animal cushions! Only 55 pounds (from the UK) for 10! 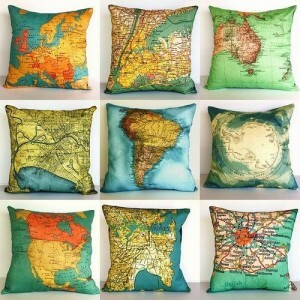 I could almost justify buying them and having the send to Australia… depends on the postage. 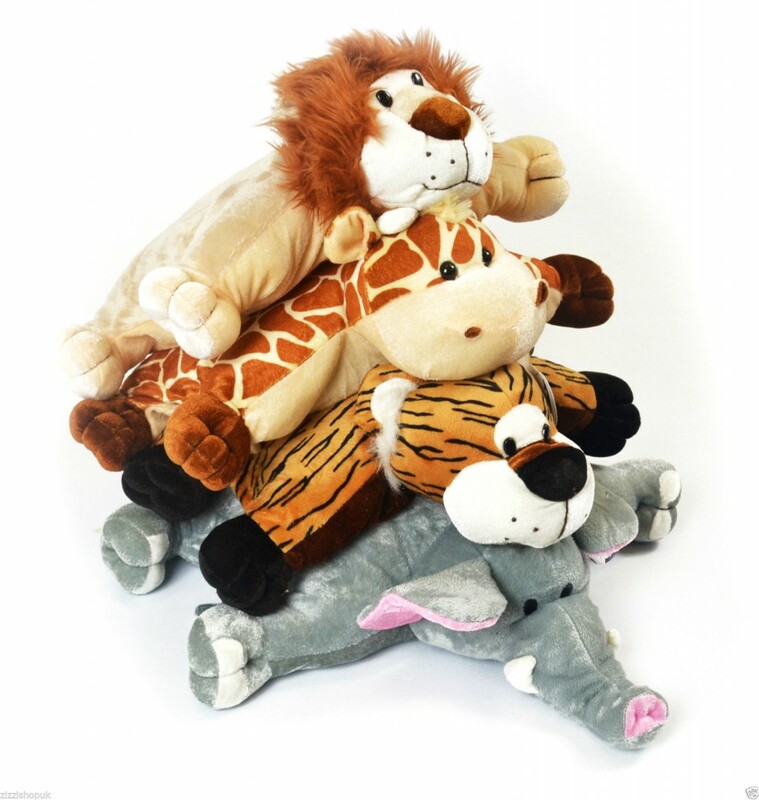 I used to have some of these animal fold up cushions, but they don’t last long in the classroom before you have to throw them out. Maybe time for some new ones? 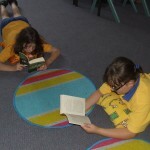 There are other uses for the cushions/beanbags etc besides just for reading. I have some little stool/ottoman shapes that selected students can sit on when the rest of the class is on the floor, either to keep fidgety students more focused, to alleviate some of the crowding that goes on when you try to have up to 32 students on the ground, as a reward, to keep certain students away from each other, so shorter kids can see over the others’ heads. One of my ottoman’s got broken (well 2 out of 3 actually) last year while I was on leave – always happens then doesn’t it? So I need to look out for mini stools/ottomans as well as replacements. You are also limited by the classroom size and space as to how many and what type of cushions, chairs etc you can accommodate. I love the idea of director chairs, fold up chairs and couches, but could never fit them in the classrooms we have at our school! 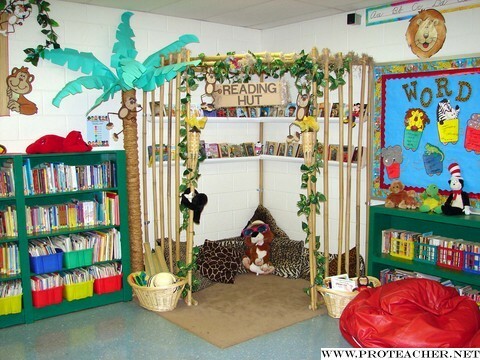 I have grand visions of palm trees and canopies for my jungle theme, like the classroom below, but we’ll see what we can fit, maybe just start with 4 cushion and my newly created jungle signs, see my teacherspayteachers store! A fresh start! I think this is something all teachers love, the start of a new school year with a new class, sometimes even a new school and/or a new room! Setting up things, I always have that “this year I will…’ voice in my head with everything from managing student behaviour to how I distribute the pens. The summer break is the perfect time for teachers to recharge and consider new ideas for the new class, which in Australia arrives January 28th. 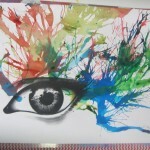 A lot of looking at ideas on Pinterest too I think! 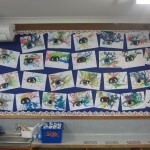 A classroom decorating theme. Some of my posters and labels have been in use for over 10 years, so it’s time for an upgrade! 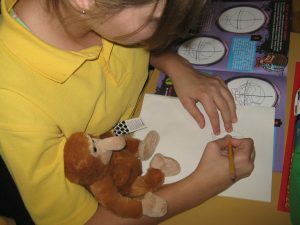 Decided on a jungle / rainforest theme, which will incorporate quite nicely our class mascot Bosco the Proboscis monkey. 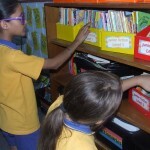 Managing the borrowing of classroom equipment. I spend a small fortune on pens, pencils and whiteboard markers (among other things) for students to use who constantly bring no equipment. It seems to vanish within a fortnight! I don’t want a system that will take forever to sort out or manage by me. I think the best option I have come up with is the popstick borrowing system. 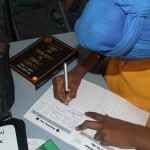 Each student gets 6 posticks with their names written on the end. Every time they borrow a ruler, pen, eraser, etc they have to put one of their popsticks in the container UNTIL the item is returned. Once returned, they remove their popstick. 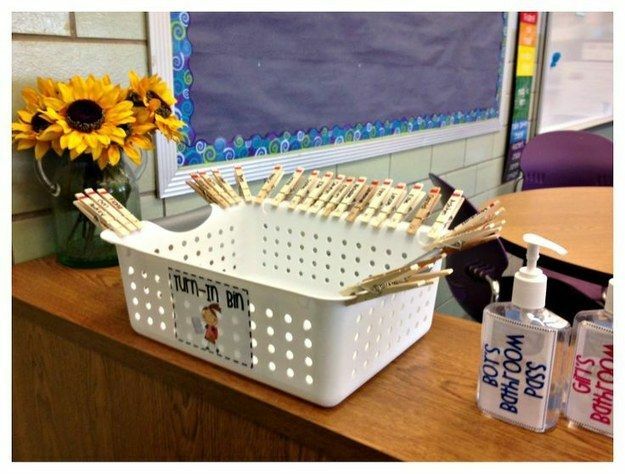 Students can keep their popsticks in their pencil cases or tote trays. Some will never use them, but have the option, some will use ALL 6 AT THE SAME TIME. This way I can track who hasn’t returned their items as their popstick will still be in the container. I may even introduce some sort of consequence for those who consistently don’t return items (and with the popsticks I can tract WHO!). Maybe a ban from borrowing? Or lunchtime sharpening duty… We’ll see how successful it is! 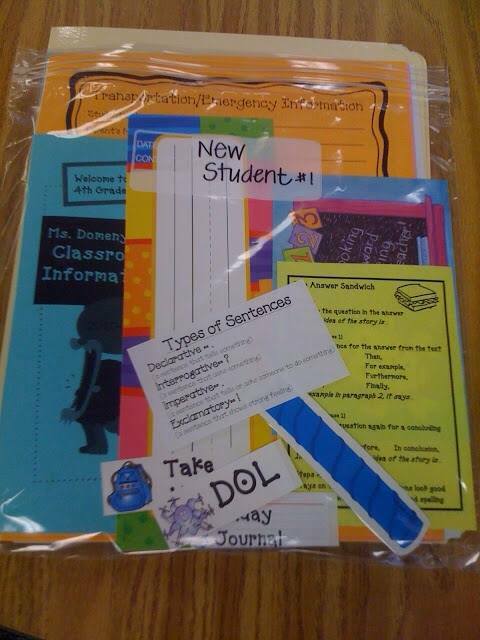 New student packs! 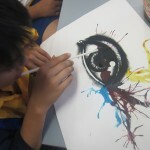 I saw this idea on the relief teaching ideas facebook page, its a step up from what I usually do. In my first ever year of teaching I got EIGHT new students. That taught me a lesson! From then on I always prepare more book covers (painted, contact, wrapping paper) just incase. 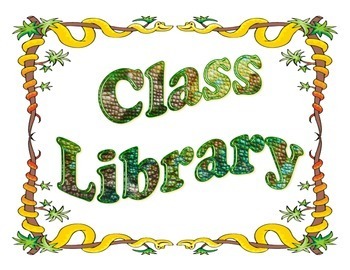 Any title pages or colouring sheets always got copied 5 times extra and kept in one place in the classroom for those new students. Having it all in a plastic sleeve is a great idea. Managing work collection. I saw this idea on Pinterest (no surprises) originally from buzzfeed – a very simple basket idea to track who has and hasn’t handed in work. The trick will be emptying it regularly for reuse, or I may need several baskets! There are other things I am considering (as I peruse Pinterest) but these are the ones I’m locking in for now. What are your back to school new ideas for 2015? Every day my students need to read independently (I call it ‘Indepedendent Reading’ also referred to DEAR time or USSR time). They have to read a chapter book of their choosing. My novels are broken into 3 levels, and at the beginning of the year I tell them which level of fiction matches the various PM reading levels. We discuss ‘real readers’ v. ‘fake readers‘ and I have a chart that goes with this discussion. 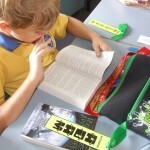 I provide a bookmark for each student and allow them to keep the chapter book they are reading in a tub on their desk, as reading a novel is often a task for early finishers. I have a lot of other books on the bookshelf besides chapter books, but I find some students will always choose joke books, picture books, drawing books or non fiction texts. 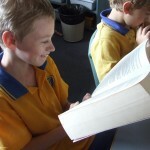 I understand that they love those sorts of books, but I want to ensure they are reading a range of texts at their instructional level, and can maintain the reading of a long text over a number of days or weeks. But if I make them only read chapter books, when will all those other books get read? There were two things I did to address this issue. 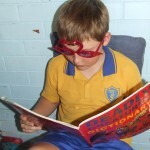 I tell them they have to read a ‘chapter book’, not necessarily a novel. That way the non fiction fans can read the ‘Horrible Histories and Horrible Science’ books – still in a chapter book form. Also, each week one reading group gets to have ‘free choice reading’ – whereas for the whole week they can choose any book they want and also get to read on the cushions and wear the genre glasses. it was too hard changing groups each day for free choice reading, so rotating through the groups each week is less disruptive. I had a few parents comment at the Parent Teacher Interviews that they have noticed their child has increased their level of interest in reading this year, so all the things I’m implementing must be working! After my initial assessment of students’ narratives at the beginning of the year, I saw way too much of the common things students do that holds back their writing. Dialogue that takes up the whole page with no reference to who is speaking. Eek! Every year. 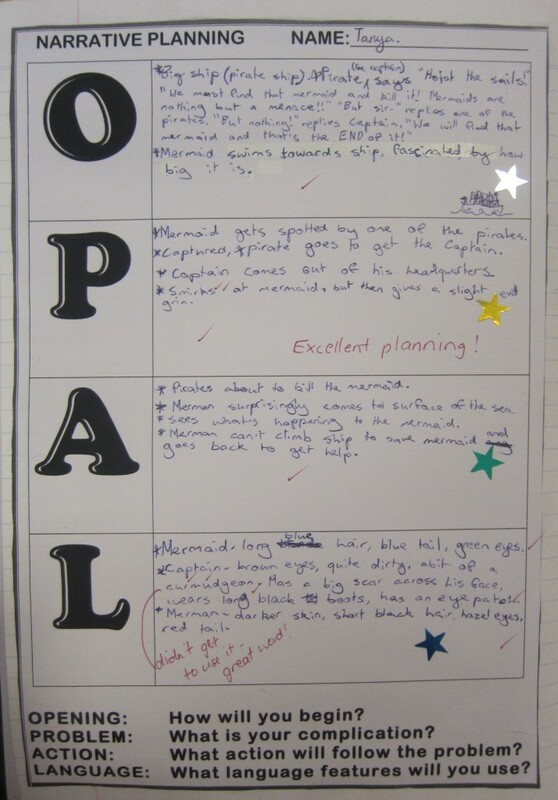 So I made some ‘tips poster’s to use as we developed our story writing skills. There are 8 posters in total, with a butterfly theme. They are available in my TeachersPayTeachers store!